In Tamil Nadu, salads are known as Kosumalli. 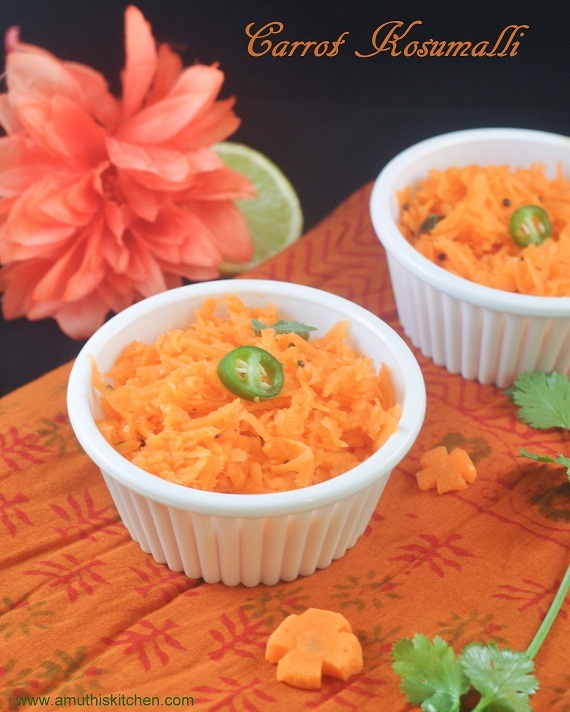 There are different varieties of Kosumalli using raw vegetables with carrot kosumalli being the common one.It is served in South Indian weddings and on special occasions. This is such a refreshing salad. I usually toast some peanuts and add that too to this dish for the added crunch that it gives. Healthy,colourful and the most favourite salad, just love it. Wow what a refreshing colour!..simple and best..
simple and healthy kosumalli salad. Very easy to make and nutritious too..
one of the simplest and delicious Salad I have ever had!!! Good one. I usually make this and mix it in curds ! Colorful one. One of my Sri Lankan friend use to this for all parties. It tastes good and goes with all type of food. Lovely kosumbari. My mother used to make this to go with rotis, if she was in a hurry. Such a delicious & colorful salad. I was looking for a salad to make for lunch. I will try this one! Simple salad , but with a good flavor.